You may (or may not) know that I’m a wannabe skier. I have been lucky enough to go skiing a couple of times – Italy (twice) and Canada. I’ve also skied in France but only for a day. I’ve not been skiing since having the girls and I don’t know when I’ll be able to go again. I can envisage that my days will not be the same as they were before. I think Crystal Ski would see me as an “Unstoppable”…. and here’s how I imagine our day would go. I’ll spend most of my time chasing after the kiddiwinks – making sure they have their skis, hat, gloves, and helmet (*) before sending them off to ski-school. Once they’ve gone with their instructors I would hit the slopes myself and get a couple of decent runs in – or alternatively would have to join hubby on a smaller run since he’s not an experienced skier (never skied in his life!). I should point out that I’m not an experienced skier but at least I know how to put on a pair of skis! After the kiddiwinks and hubby have finished their lessons we’d grab a spot of lunch before doing some small runs on our own – practice makes perfect! When everyone has had enough (skiing is very tiring!) we’d pack away those skis and try to catch some of the other fun activities such as bum-boarding. I’ve done this before and it was FAB! I know the girls would love it! We’d then go back to the village and catch some supper. No doubt the kiddiwinks will be tired so afterwards it’d be back to our nice cosy chalet to catchup on some sleep. Hubby & I would stay up a bit after they’ve gone to bed – can just imagine us having a chill in a nice jacuzzi – perfect for aching muscles. Afterwards we’d need some sleep because all this would be repeated the day after! Make the most of it eh!?! I should point out that all of this is what I assume would happen since at the moment my girls are just a tad too young to go on a ski holiday!But as soon as they’re old enough to put on a pair of skis I’ll be taking them for sure! How about you? 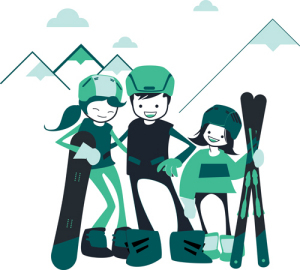 Are you a skier/snowboarder? What would your #skiexplorer days be like? Considering I’m the most clumsiest person ever I think it’s amazing that I haven’t broken my legs! Still can’t get over Schumi though! The shame of it!! Would you like to go skiing? I learned to ski in Calgary on some of the slopes used in the winter olympics (yes I am that old) – I would love to take mine skiing and was worried they would be too young, but having had some time on the snow yesterday at a snow centre, they are more than ready!! That’s awesome! Hey no you’re not that old! How old are your little ones? Mine are 22 months and 4 months and it’s difficult enough to contend with shoes never mind skis! It’s a great experience! You could always try one of the real snow centres if you want to give it a go without spending too much! I’ve been skiing a few time. Mainly Santa Catering in the Italian Alps. Never been with the kids but would love to go with them. Will have to wait a few years now till #Babypink is old enough. Would be great to whizz down a nice bit of fresh piste with the kids, slopping half way down for a mulled wine and hot chocolate for the kids. I’ve never been skiing and I don’t see myself never going to ski either! I’d be petrified haha!